Pebbles are a beautiful way to accessorize and accentuate! To copy this pendant you will need a shaped pendant mount with a hanging ring at the bottom, two pieces of baroque stained agate, one suitable for making a pendant, a bell cap to fit the latter, a jump ring and a suitable chain. First apply the bell cap to the pendant stone and stick with strong epoxy glue; leave in a salt pot to set. Stick the other stone in the center of the pendant mount. 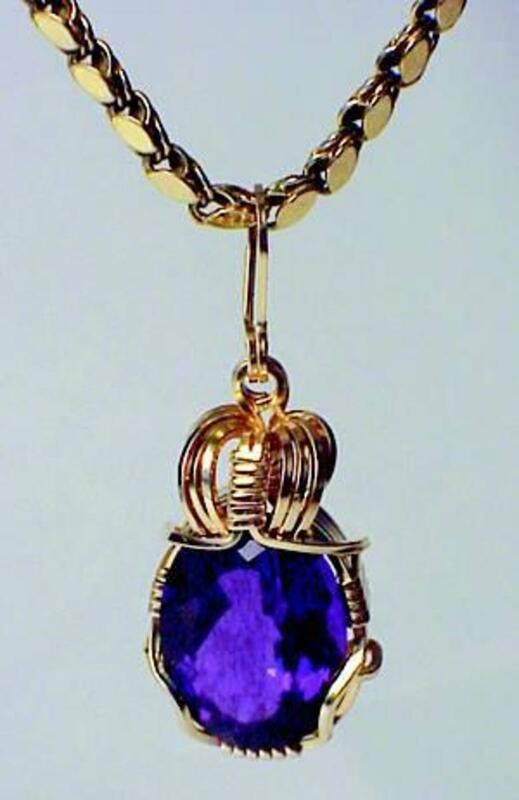 When both are set, fix the pendant stone to the bottom of the pendant mount with a jump ring and hang on the chain to complete. Choose a copper mount with a hole through one of the star points, and a large cabochon stone to fit on the center of the mount. Polish the mount with a little metal polish and then stick the stone in place. When dry, fix a jump ring through the hole in the mount so that it can be hung on a chain. I chose two pendant-shaped baroque stones, one a piece of rose quartz and the other a green agate. In each case, the stone was examines to find the best display face, then the mounts were pressed in position and stuck in place. 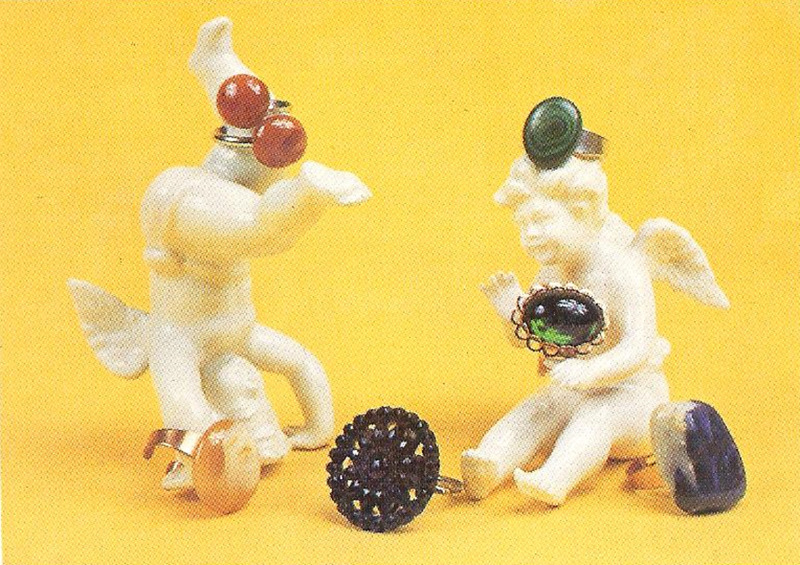 When dry, jump rings were applied for hanging. 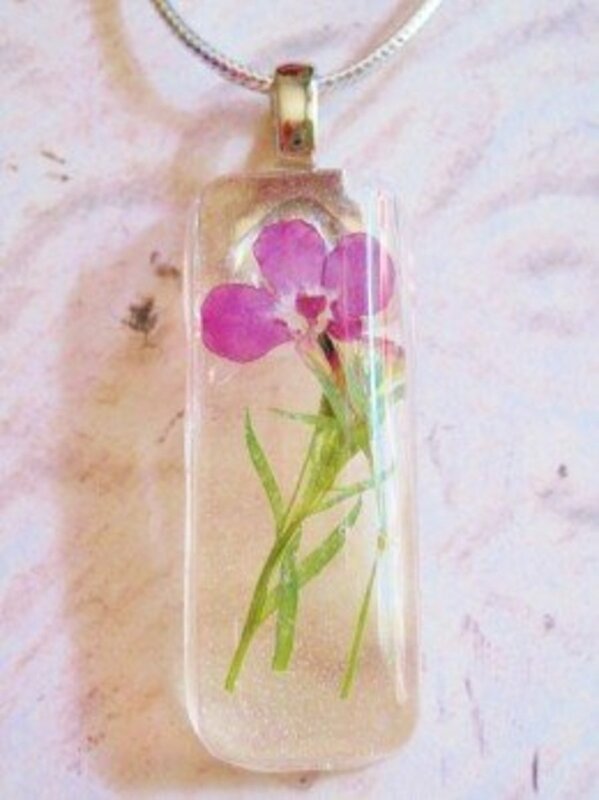 It is sometimes possible to buy pre-cut pendant stones such as the heart-shaped one in the illustration. These have a hole drilled through the top to take a large jump ring or shaped mount such as the one illustrated. No sticking is necessary, but the mount must be pinched firmly in place with jewelry pliers. Pebble rings can be a fashion statement when worn with the right clothing. Just a reminder before we get started - the adhesive used for making rings should be left to set for the maximum length of time before the ring is worn, rings are subject to hard wear once in use. This ring was made from a piece of jet originally used as a button. Before mounting the button, the ring at the back was removed with pliers. It is often possible to pick up an odd jet button which is not used by itself, but can be made into a nice piece of jewelry. You will also require a silver ring mount, with a flat pad. Coat the mount with a little adhesive and gently press the button in place. Leave in the salt pot until completely set. You can buy ring mounts with two pads for stones, giving an attractive cross-over effect. Contrasting stones may be used, but I chose two carefully matched cabochon cut carnelians. They were stuck on the adhesive-coated pads and left in the salt pot until set. The recessed mount of this ring has a lacy edges, making an attractive setting for the plain cabochon cut green stone I chose. Look through your selection of stones for the correct size to fit mounts of this type. A formal mount of this type should have a correctly cut and sized stone, so be careful in your choosing. Apply adhesive, drop in the stone with tweezers, press it down lightly and set in your salt pot. 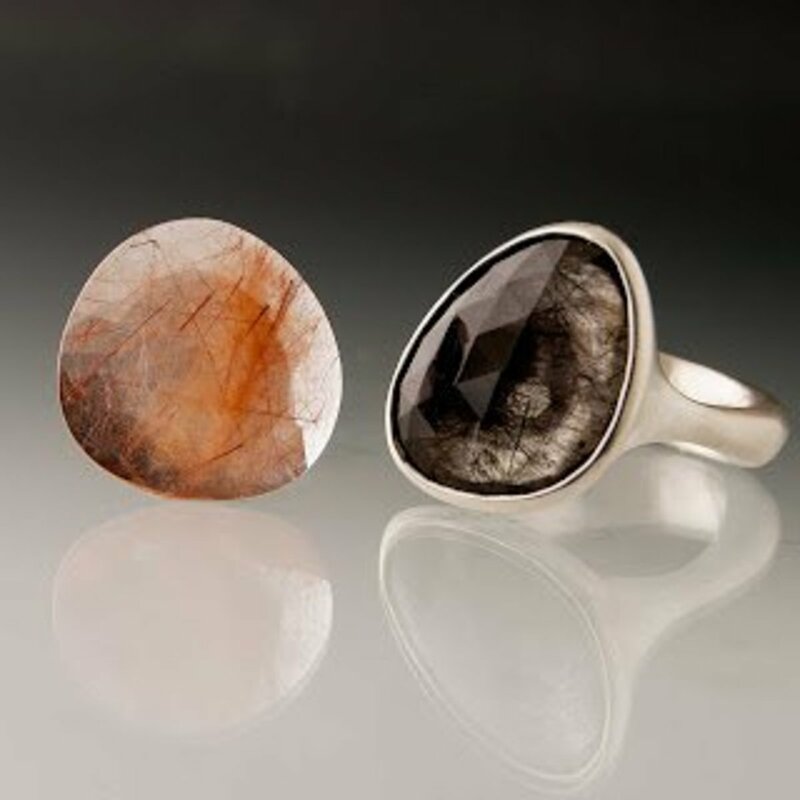 These two simple rings rely for their attractiveness on the beauty of the stones. The blue sodalite is a baroque stone, simply mounted on a cut gilt mount, and the green malachite is a cabochon cut and set on a flat-pad silver mount. Stick with the adhesive and leave in the salt pot until set. Because of the hard wear bracelets can see, stones mounted on the bracelets should be left to set for three days before wearing. A wide variety of semi-precious stones are available on the market today, they are cost effective and beautiful in a hand made setting. 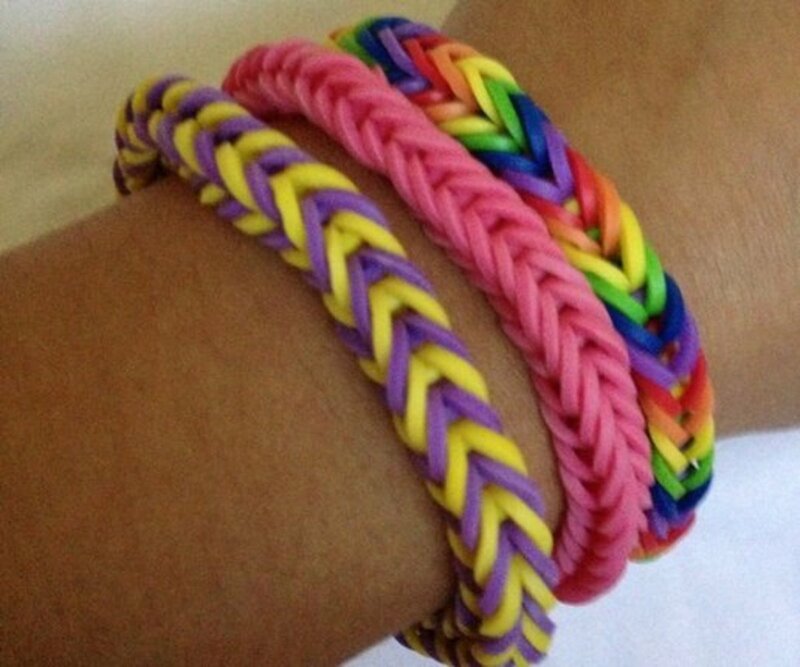 Here are some variations for you to try at home. With any multiple group of stones, it is important to match them roughly to size and shape, so select and group pebbles in relation to your bracelet chain before sticking. In the bracelet shown, the central stone is more regular than the others, which are placed with the lower points facing out from the center. After choosing, try various bell caps and pick one of a suitable size (not too small, or it will not be strong enough, or too large as it could look clumsy). Stick stones and caps together with the hole in the cap facing the same way as the display face of the stone. 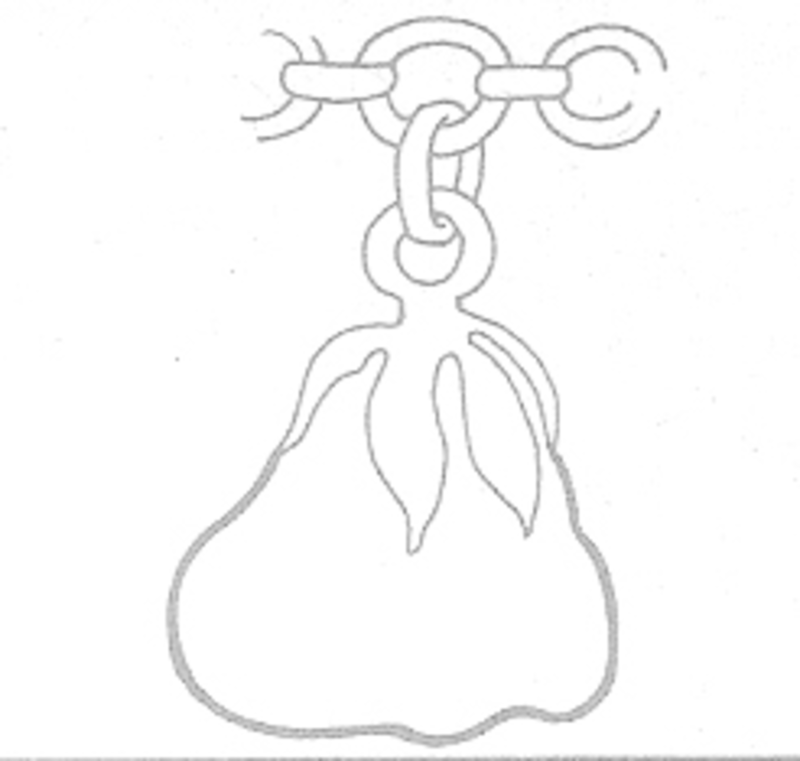 When the jump ring is put on and fastened to the chain the pendant will then hand facing the right way, as shown in the picture here. 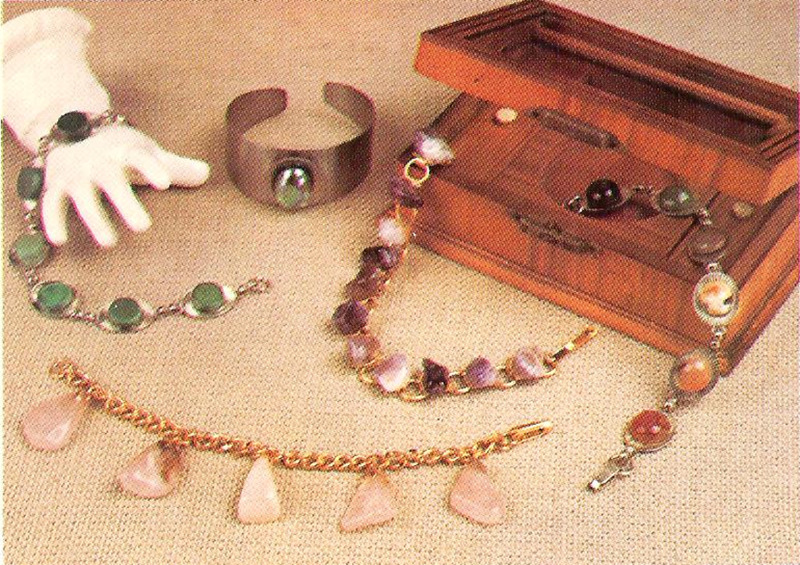 When stones and caps are firmly stuck, lay them along the bracelet chain and count out the links so that the stones lie an equal distance apart. 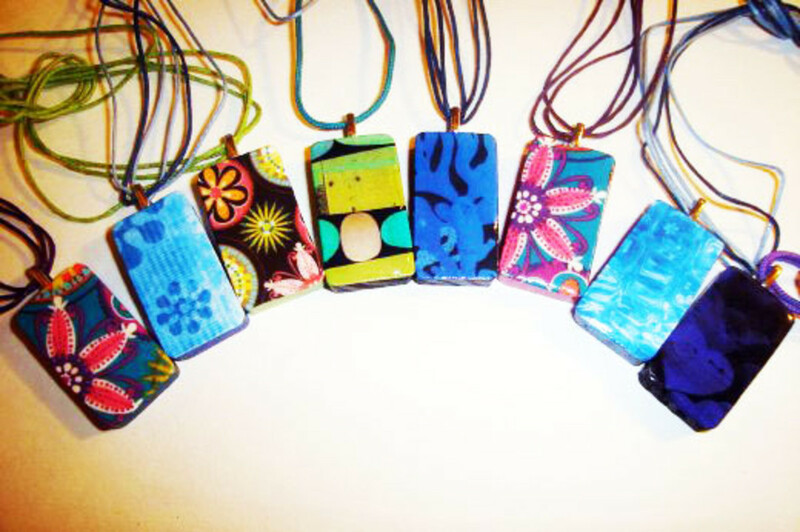 Then fix each pendant to the chain with a jump ring opening and squeezing firmly closed with your pliers. The beauty of this type of baroque bracelet lies in the subtle color variation. 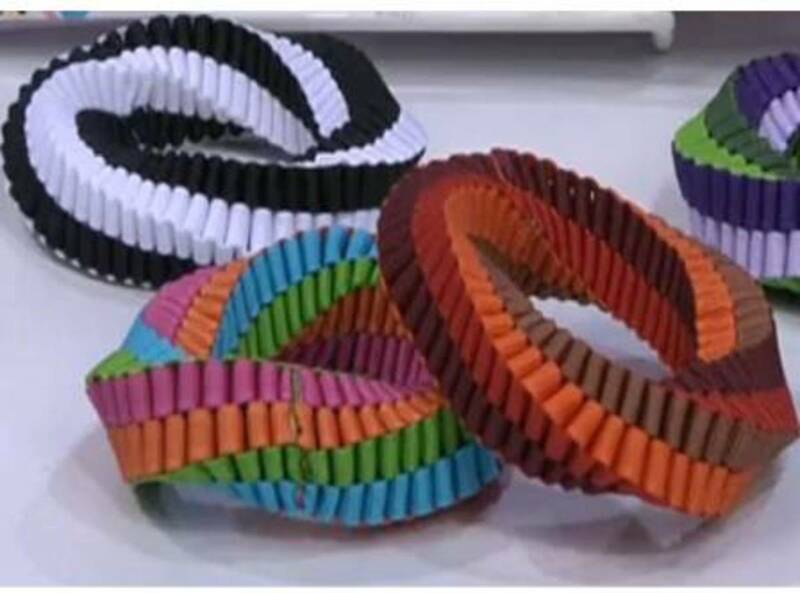 To copy, select stones, apply adhesive to pads and stones and stick together. The type of bracelet mount with incised lines radiating from a central point on each pad calls for small, regularly shaped stones. 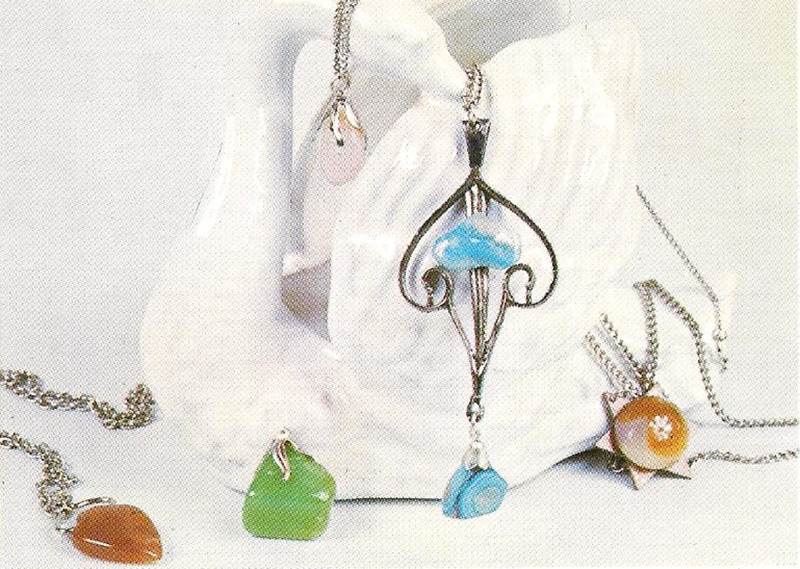 As a change from curved cabochons, look for round, flat pre-forms such as the aventurines shown in the picture. Glue centrally on the pads of the mount and leave to set. 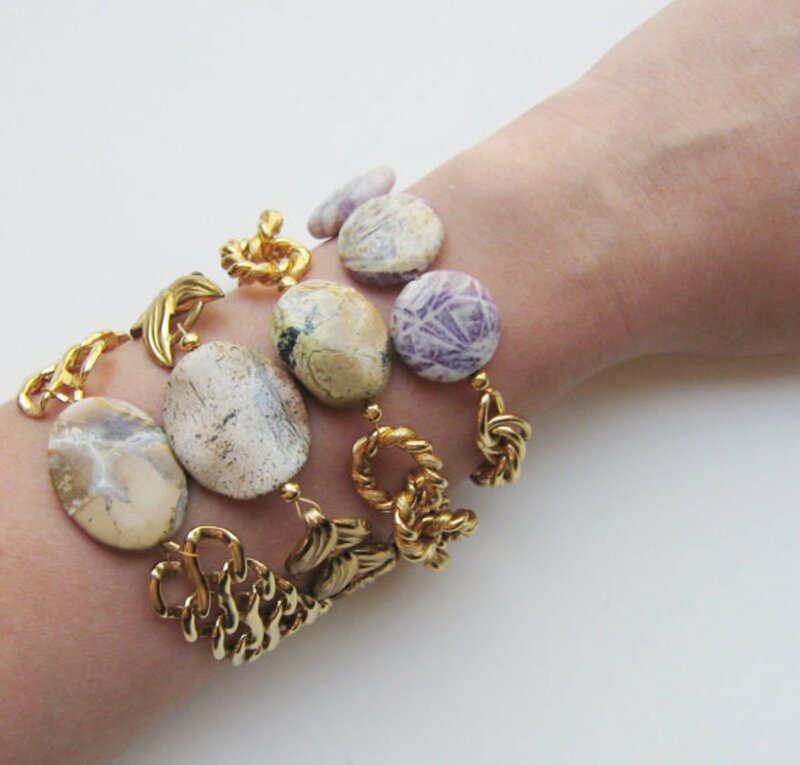 The display pad on this type of bracelet can show off any large, handsome stone to advantage. Consider mounting and interesting fossil (almost in the pebble category). 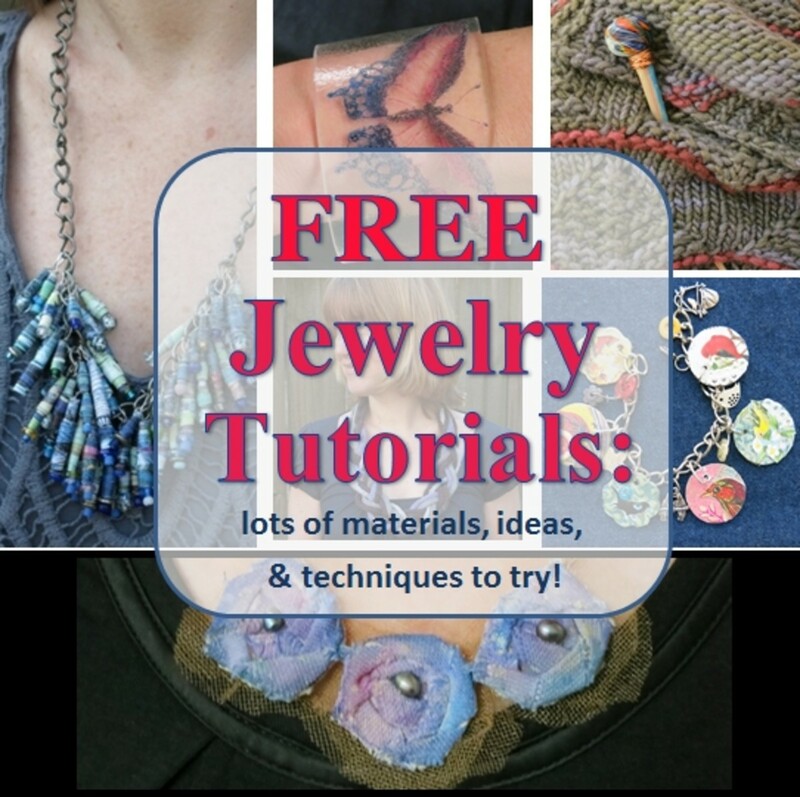 Sounds like good ideas - I love jewelry making and pebbles are good ways to switch my repertoire up. I love the blue agate pendant. It might be just the thing for this season and of course cruising!